View from the front door, after the wall was torn down. When Jeff and I decided to move to the big onion, we knew from the get-go that we wanted to be in Brooklyn where things are a LITTLE closer to Los Angeles living (a bit more space, quiet, and a place to park our car). One important change we wanted to make was to move into a big industrial space. Though we loved our quaint little craftsman in LA, with me working from home a lot, it was time to have something more open so my mind grapes could grow. Also, my eclectic taste in furniture and art was starting to look more like a crazy grandmother’s house in an already vintage space. In other words, we needed to put all my old crap in a gallery space to make it cool again. We looked at about 25 apartments all over Brooklyn in one weekend. The first place we saw was what we finally settled on, for a few reasons. It was really big, 1400 square feet with a full roof all to ourselves. No neighbors, it is one of three garages on an otherwise empty block, and the other two garages belong to our scrap metal landlord who leaves everyday at 4:30pm. And finally, it was the only place that felt like a home. It is our own building, with a door at street level, a full roof and it came with permission to do absolutely ANYTHING we wanted with the interior. Hindsight is a you-know-what, but at the time it seemed like a dream. We knew it needed a lot of work in terms of painting and cleaning, but what we ended up getting into was much tougher than we ever could have imagined. In our defense, neither of us had ever tried living in (or renovating) an old car garage, so our life experience wasn’t helping much. 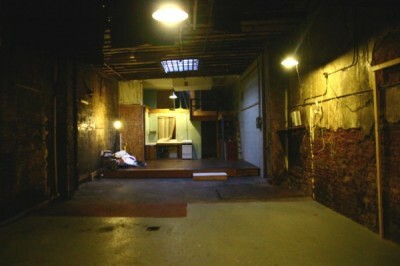 This was the first room you came into from outside, which was once a woodshop for the former tenants. Looking into the rest of the space through the workshop door. Walking through the door, into the living space. View from the kitchen looking towards the front. We knew right away we wanted to tear down the wall with the door to open the space fully. Main bathroom. Super weird and cobbled together from random elements. Someone seems to have poured cement around one half of the tub…to seal in the water?? We hired someone to remove the wall for us, opening up the space into one big room.